There was a time when I had several magazine subscriptions – yes, those rolling subscription contracts that you always forgot to cancel and only remembered when the amount had been taken out of your bank account already! I recall that I only really flicked through the magazines, reading certain articles, skimming over most of them – they were mostly full of adverts so it was a fair amount of money to pay for just a few minutes of actual reading. Anyway, despite so much free information being available at my fingertips these days, sometimes it’s nice to read about one of my favourite hobbies (personal finance!) on a medium other than a pc or tablet screen. Hence I was drawn to certain financial magazine subscriptions on offer, which I’m sure many readers will have seen being advertised, Moneywise and Money Observer. These magazines cover general financial topics of the sort that you would read in say, the money section of the Daily Mail. In the issues I received, articles included guides on controlling debt, how to save money, active vs passive investing, how to purchase a holiday home, info on the recent changes to pensions and how not to get scammed. In one of the issues, I also received a supplement on investment trusts, which I found very useful. This magazine was aimed more at people who already had some knowledge of investing. Articles and information had a lot more detail about investments, funds and shares, but they were well written and easily understood. In the issues I received, articles included how investors could avoid the yield trap, what will happen when the bond market crashes, the opportunities and dangers of penny shares, lump sum vs pound cost averaging. Ros Altmann also had her own ‘Pension Clinic’ column in the magazines I read, probably her last pieces before she took on the role of Pensions Minister. All in all, I thought it was worth getting seven magazines for just £2. As it was so novel and different to receive magazines in the post, I looked forward to them being delivered and pretty much read all of them from cover to cover. However, although I did enjoy reading them (in particular Money Observer) personally I would be reluctant to shell out full price on a subscription – useful and enjoyable they might be, I just can’t justify that kind of spend, not when I’m trying to cut costs and ramp up my savings rate. I’ve since found that if you wait a bit, some of the articles in the magazines appear on-line, so I now check out the respective websites regularly for updates. For now, the magazines are in a pile and I have occasionally returned to them for reference, although at some point, as regulations change and the government makes further inevitable tweaks to pensions, ISAs, etc, they’ll be binned as they’ll be out of date. (One’s gone already as it was pretty much all about the elections). I’ve not been tempted yet to go for the special offers on weekly financial magazines, but will probably give them a go too at some point. Are there any other offers/magazines worth checking out? If you are looking at magazines, have you tried the digital versions, as you get a replica of the print copy, but don't clutter your home with them. If you have a tablet you can also look back at them easily wherever you are. Nice to see you are continuing your progress (although I have not been posting I have been reading your blog) and that your portfolio continues to grow. I hope everything at work turns out OK for you. 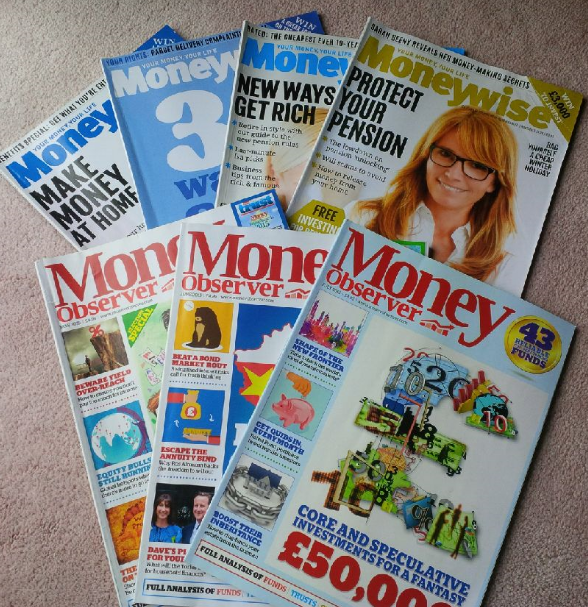 Yes, I had a look at the digital version of Money Observer but the reason why I went for the actual magazines was to experience a different kind of reading, or rather 'old school' reading! But you're right, the trouble with the actual publications is clutter (mine are hiding behind the sofa at the moment haha!). Thanks for your kind words of support, good to see you about and hope all's well with you. When I was a beginner I used the public library. I found the Saturday FT good, Investors' Chronicle OK, and Money Management excellent. Fun experiment! For just £2 I wouldn't have said no either. Even though I've never had any magazine subscriptions, I can see why it's fun to pick them up and browse through them instead of sitting behind a computer. However, I can never get myself to subscribe to a magazine. Maybe it's my weird internet-age brain that says it's weird to pay money for information that's freely available on the internet? I hope you find some more magazines to check out! A long time ago I worked in a library and "fights" over Investor's Chronicle were common. We had to keep it behind the desk. I don't think the library subscribes to the paper copy any more although there maybe something available via Zinio. Thanks for the tip, dearime. I'm often in the library on a Saturday morning so I'll have a look out, although I have to admit, I don't even check out FT.com so I may do that first. Cheers! Well you are putting those magazines to good use (including relaxation in the bath!) – it's when people end up subscribing and not even reading the magazines that is a waste! Thanks for the tip, which follows on from dearieme's library tip – if I don't see Investor's Chronicle out on show, I'll ask at the desk! I have a 'free membership' with online Investor's Chronicle but it's quite limited with what I can read. I guess not many people your age would have magazine subscriptions – it's something folk (like me) had before there was so much available on the internet! That said, there's free stuff on the internet but there's also paid for premium stuff – right now, I'd rather not pay to read stuff online. Money Week is one of the weekly mags that I considered so I'll give this one a go at some point.